Delete photos with this icon or press delete key on keyboard when photo is selected. Move photos up or down in the list using these arrows. You can also right click on a selected image and select Move picture to position and insert the position you would like your photo to be moved. Example: you want photo 113 to be the 5th photo shown in your slideshow, enter '5' and press ok.
Rotate your photos clockwise or counterclockwise. To edit the photo selected in more detail this press this icon to open Edit Slide window. 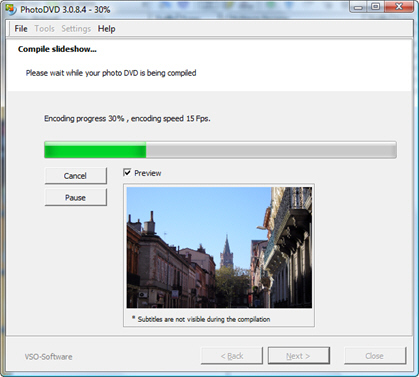 Chapter points can help you navigate through your slideshow once it is burnt onto DVD. Use the button >> on your DVD players remote control to jump forward or back to different chapter points in your slideshow. Chapter points are also used in the DVD MENU. Chapter point are automatically added to your project every 2 minutes. This default settings can be changed in the Settings | Chapters. In the Photo list you can also add custom chapter by right clicking on a photo and selecting Add chapter marker. If you only want custom defined chapter points you can uncheck the automatic chapter markers in the settings. Automatic chapter points are in marked by white flags, custom chapter points are markted by orange flags. You can also add Chapter Text to the chapter markers you have added. The chapter text defined here is used as a lable of the chapter point in the DVD Menu (if you select to use "Chatper Text" under Chapter text format in the DVD Menu settings. See DVD Menu Settings for more information about menu presentation and chapter text. The first blank line is to enter a title for your slideshow. This will be the title that shows on the DVD Menu if you choose to include one. With default values a DVD Menu is created unless this is changed in the settings. Total time is the the total playing time of your slideshow. This is based on the number of images in your slideshow and their display time (including the transition time between images). The overall display time for images can be changed in the Settings | Imaging . Edit Settings opens the Edit Slide window where you have more options to edit your photos. 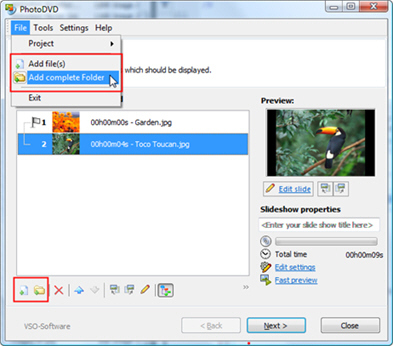 You can acces the Edit Slide window by double clicking on an image in the list or by clicking "Edit Settings" under the Slideshow properties section. Click "Next" on the bottom right hand corner of the window to move on to the next step (adding music). Delete music with this icon or press the delete key on your keyboard when the song is selected. Order your music by using these icons. Create up to 3 different playlists to go along with your slideshow. Each playlist may contain multiple songs. Highlight a song and press the green play button to listen to the music file you added to your project. You can also double click on a file added for the song to start playing. To jump further into the song click further along in the time dispay box (blue bar in image). Notice that depending on the tags already provided by your music file you will see the Artist name, title of the song, and length of the file displayed. Under Playlist properties you can enter a name for each of your playlists. These playlist names you provide will be used in the settings menu on the final DVD. You can also see the space your slideshow will take up on a DVD. You will find the total time it will take your photos to play (a sum of the photos display time and transition time). 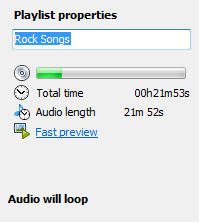 Underneath that you will also see the audio length of the playlist displayed on the left. You can try to match up your photo slideshows playing time with you audio playlist time. 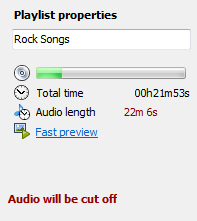 You have information provided below if your audio will loop or be cut off depending on the length of the audio files you have added. To match up your music and photos, you can also change your photos display time or transition times, as well as add or remove audio files. If you have added different playlists you can change between tracks by clicking on the music note icon. If you have added multiple tracks of comments you can select a different track to play by using the icon with letter A.
Click "Next" on the bottom right hand corner of the window to move on to the next step (compiling & burning). Output format: Select PAL (Europe) or NTSC (N. America) depending on the region you live in, see wikipedia for your region. Also choose if you want your slideshow to be in Fullscreen 4:3 or in Widescreen 16:9. Target Device: For your target device you can choose to compile your slideshow and burn it directly by selecting your DVD writier in this drop down list. If you would like to compile the slideshow to your Harddrive, you can do that too, and burn your project at a later time by going to Tools | Burn an existing compilation. If you have selected your burner a red light will appear if you have not inserted a DVD, or if you DVD is not blank or is not detected correctly by your DVD writer. The light will be green if you have inserted a blank DVD. If you see a yellow light it is because the disk you inserted is a rewritable disk and you must give permission to erase its contents before burning your slideshow to this disk. 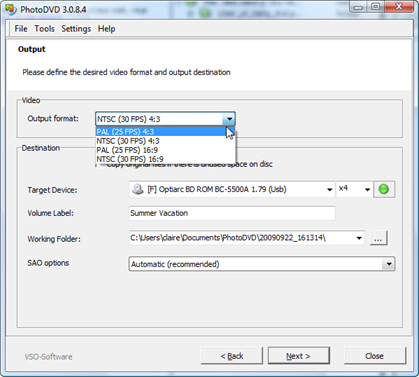 *PhotoDVD does not work with CD writers nor does it burn to CDs. Volume Lavel: Provide a name for your DVD, this label will be seen when you insert your DVD into a computer. Working folder: Define a different working folder other than the default location if you would like to change this. Navigate to that location by using the button to the right ... The path file must be complete, i.e. starting with C:\example-of-location\folder. SAO options: This drop down provides a list of different burning methods. It is best to leave this method on automatic. If you are having problems burning DVDs, best contact the technical support for help, in some cases changing the burning method can solve burning issues. Click "Next" on the bottom right hand corner of the window to move on to the next step. You will be presented with a preview window title "Ready to Compile" showing the details of your project. Click "Next" on the bottom right hand corner of the window to move on the next step where your slideshow will begin compiling. If you have inserted a blank DVD the burning will begin automatically. To burn another copy of your slideshow now or at another time, go to Tools in the top navigation bar, select Burn an existing compilation.